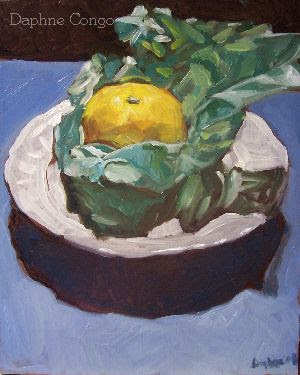 In the painting class I teach on Monday nights, I set up still lifes of mandarin oranges slightly unwrapped of their paper on top of these glistening white plates that sparkled like jewelery. Then it was set on blue paper. The layers and shapes that the colors and the shadows made were very inspiring. Everyone's paintings that night really inspired me and I got together with a friend of mine and set up the same still life. I loved looking at the subject and I really like this painting. What do you think? Does it repeatedly catch your eye as it does mine? The following week I guided the class through a positive critique that went incredibly well, thanks to everyone's participation. We focused on Why paintings work and Why we are drawn by certain paintings. I will be holding a workshop in the new year of positive critiquing and where people can bring in their work and we can talk about it positively. We will also discuss how to take criticism and how to discuss art constructively. If you are interested please check out my blog tomorrow as I will have all my upcoming courses and sessions posted.